Pumpkins and pumpkin carving are an integral part of Halloween. 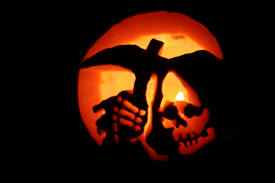 Here is a collection of articles to inspire your pumpkin carving efforts. How to Carve the Perfect Pumpkin - This article walks you through the complete process from selecting a pumpkin to carving an awesome masterpiece. Free Pumpkin Carving Stencils - A collection of stencils to carve the perfect Jack O'Lantern and inspire your Halloween spirit. Amazing Pumpkin Facts - Things you never knew about pumpkins! Creamy Custard Pumpkin Pie Recipe - It’s Halloween and you’re having some friends over for a few tricks and a couple of tasty treats. What if you could prepare a delicious homemade pumpkin pie in practically the same about of time it would take you to drop that lump of pumpkin pie filling into that crust? Roasted Pumpkin Seed Recipes - Roasted pumpkin seeds are easy to make, taste great, and are filled with lots of protein and fiber. How to Make Delicious Pumpkin Muffins - Preparing freshly made pumpkin muffins is a terrific way to warm your loved ones’ bellies before they head out into the cold, crisp autumn air. How to Make the Perfect Pumpkin Soup - Making a fresh pumpkin soup for any Halloween or autumn meal will really impress your family and friends this time of year.